I am posting this one because it took me a little while to find a solid solution. Everything I found had an answer, just not an answer that works. With this solution, you will be able to connect to and pull data from an MS Access database with VBScript. connStr = "Provider=Microsoft.ACE.OLEDB.12.0; Data Source=C:\Users\username\Desktop\example\example.accdb"
getNames = getNames + rs.Fields(0) & ","
connStr = "Provider=Microsoft.Jet.OLEDB.4.0; Data Source=C:\Users\username\Desktop\example\example.mdb"
There are many creative reasons for connecting to an Access Database with VBS. Please comment with questions, suggestions or improvements. 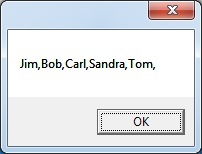 Was not able to connect to my Access database with VBscript in Windows 8. Thanks to this post I got it working by running cscript in c:windowssyswow64 directory. I’ve tried everything you say about forcing 32bit but the error persists. I have verified that there’s nothing wrong with my script because it runs perfectly on another computer, but on my laptop it just won’t! Please help. No matter which database format I use, which Provider connection string I use, all the providers “cannot” be found. What’s wrong with my laptop? maybe post your code, lets see what you are trying to do. It looks like you may need to pass a password in the connection string. I am writing this comment from my iPhone so I don’t have the ability to post a good example but I found this https://www.connectionstrings.com/access/ the site looks like it has some good examples of this.